THE MOST DETAILED, BEAUTIFUL AND EASILY SCRATCHABLE MAP OUT THERE!! Designed to the highest visual standards - rich with cartographic information like borders, cities, rivers, islands and mountain ranges. The gold and vibrant colours underneath means it's something you'll be proud to hang on your wall alongside your favorite travel photos. ARE YOU READY TO GET SOME FREE GIFTS with this cool map? 4 bonus gifts complete The Whole Package: a scratch tool, colorful stickers to help you mark and plan your next adventure, and a golden erasable marker to record must see beaches, treks and where you've seen the best sunset ever. A GREAT EDUCATIONAL TOOL THAT IS LOTS OF FUN! Kids love scratching off the gold foil to reveal the map below. Helps develop their understanding of geography and different nations, capitals and rivers in a joyful way. WANT A PERFECT GIFT FOR ANY ADVENTURER? A great reminder of your past adventures, and inspiration for your future journeys around the globe. Click ADD TO CART NOW! We promise you that you'll love it! OR WE'LL SEND YOU YOUR MONEY BACK! LIFETIME WARRANTY. TRACK YOUR TRAVELS & INSPIRE YOUR NEXT ADVENTURE! BEAUTIFUL CLASSIC DESIGN & THE MOST DETAILED CARTOGRAPHIC WORLD SCRATCH MAP OUT THERE! US STATES OUTLINED - When scratching off countries you've traveled to, you'll reveal different vibrant colors for each country, cities, capitals, rivers, islands & states outlined - so you can scratch off US States you've visited. Designed by professional cartographers to give you accurate info and the most thrilling experience. EASILY SCRATCHABLE - Scratching off the gold foil makes the experience fun & exciting! 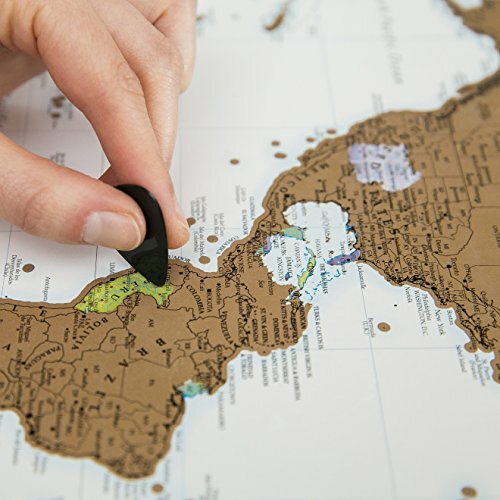 Our scratch the world map poster is made of high quality, thick art paper that doesn't tear easily & has a laminated cover which makes the scratching hassle free (and doesn't leave marks on the base map). Plus you get a free scratch-off tool to make it even easier & more precise! MAKE AN AMAZING GIFT FOR KEEN TRAVELERS, PLUS 4 FREE BONUS GIFTS & KIDS LOVE IT! Our scratch off map with US States comes in a deluxe presentation tube that protects the map, and also contains the FREE bundle of gifts - a scratch tool, a golden erasable marker, colorful arrow stickers, which all come packed in a carry pouch that makes it the perfect gift! EDUCATIONAL TOOL - Kids love to scratch off the world map - It makes learning Geography exciting and fun. HANG THE SCRATCH OFF WORLD MAP ON THE WALL, AND SHOW YOUR FRIENDS ALL THE PLACES YOU TRAVELLED TO, and where you are planning next! IMPORTANT - The size of our travel tracker scratch off map is 23.3''x16.5'' (590x420 mm), a standard A2 SIZE - So it's easily framed. MONEY BACK AND LIFETIME WARRANTY - We're so confident that you'll love our amazing cork map that we'll refund every penny if you don't like it! What do you have to lose? So try it now - TOTALLY RISK FREE! If you have any questions about this product by TOMOJO, contact us by completing and submitting the form below. If you are looking for a specif part number, please include it with your message.